The AIST is frequently used in career or academic counseling, because the results are easy to interpret and concrete careers are suggested for different education levels. The AIST is a differential test for the determination of school or career interests from the age of 14 and up. Main areas of application: consulting regarding school, study or career decisions, industrial, and organizational psychology. According to Holland (1985) there are six fundamental personality orientations in our cultural. Holland also postulates, that every person seeks the environment, that corresponds to his / her personality type and interests. If he succeeds, there is complete person-environment congruence. The AIST measures this congruence between a person and his or her environment. The test consists of 60 items, with which six interest dimensions are recorded: practical and technical, intellectual and investigative, artistic and linguistic, social, entrepreneurial as well as organizational and administrational interests. According to the concept of congruence, this test makes possible differential-psychological assignments of people to professions. After the instruction the items are presented one after the other on the monitor. 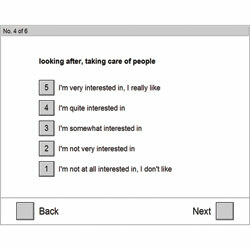 The respondent enters his / her answers on a 5-tiered rating scale. A one-time correction and the skipping of items are permitted. All unanswered items are presented again at the end of the test, but there is no obligation to answer. At present seven test forms are available. S1 corresponds to the original test form as is primarily used in Germany. Other languages have their own test form. S3 (Swedish), S4 (Czech) and S6 (Portuguese) also contain, apart from the pure translation, modified career lists and their own norms based on the computer presentation. Test forms S5 and S7 contain modified career lists apart from the translation into Italian and English, even if they do not yet have their own norms. In the meantime the German norms are used, which has to be taken into account for the interpretation. The raw scores for all scales and the response times for each item are calculated. Studies using the norm sample yielded internal consistencies (Cronbach's Alpha) for the interest scales of between r=0.79 and r=0.87. Test-retest reliabilities for the individual scales are between r=0.83 and r=0.96 for a test-retest interval of two days and between r=0.60 and r=0.75 for an interval of two years. Test-retest reliabilities are also available for intervals of three months, four months and one year. Extensive studies of the validity of the AISTR have been carried out and have shown among other things that the test has factorial validity, convergent validity and criterion validity. The norms were obtained from a calibration sample of 2,496 young people aged between 14 and 21 drawn from the most important schools and training centres in Austria. Approx. 10 – 15 minutes (including instruction and practice phase).